The Woolley Veterinarian Building was the office of Dr. Floyd E. Woolley from 1904 until 1956. It was originally built in 1893 at the southeast corner of Main and Mill Streets to be the Wilson Hills Candy Store, and the back of the building housed the Ladies Lending Library. 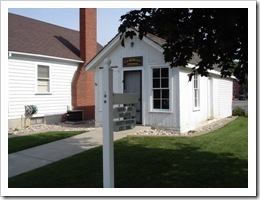 Dr. Woolley graduated from the Ontario Veterinarian School in 1904 and for a short time worked with his father in Lapeer. When Dr. Woolley moved to Davison in 1904 or early 1905, the building was for sale. He bought the building and used it for his veterinarian office, later moved it three blocks east, next to his house on Lapeer Street. Dr. Woolley practiced in the Davison area until he had a minor stroke in 1950. After that, he retired from an active practice but continued doing some veterinary work for friends and family until just before his death in February 1956. 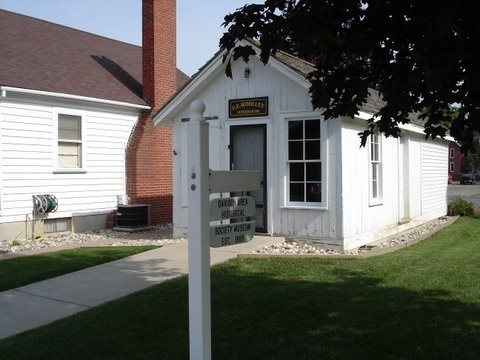 The building stayed on Lapeer Street until the family donated it to the Historical Society and it was moved to its present location, next to the museum at 263 East Fourth Street. Because Dr. Woolley did not completely retire, he kept all of his tools, papers, equipment and medicines. It is only for that reason that we still have most of his things, including the equipment, furnishings and even the pot bellied stove. In 2005 volunteers spent 430 hours restoring the roof to the original material of cedar shakes. Presently they are in the process of restoring the windows. The floor is in need of replacement and the exterior needs painting. Funds and volunteers are always needed.